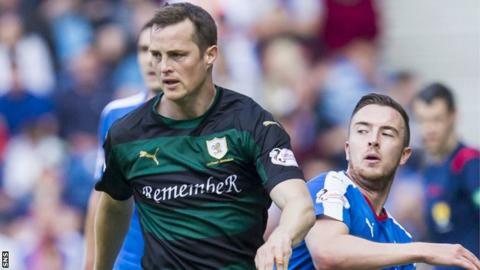 Raith Rovers striker Jon Daly is to become Hearts' new Under-20s coach when his playing contract with the Scottish Championship club expires in January. The 32-year-old former Dundee United and Rangers forward joined the Kirkcaldy club this summer. Director of football Craig Levein said he and Hearts' head coach thought it was an "exciting" appointment. "Jon is somebody that both myself and Robbie Neilson know from our respective times at Dundee United," he said. "We believe he has all the attributes to develop into a great coach." Daly is a replacement for Jack Ross, who left his player development manager post in October. No reason has yet been revealed by the club or the former Clyde, Falkirk and St Mirren defender for the 39-year-old's exit. Dublin-born Daly began his career with Stockport County and had spells with Bury, Grimsby Town and Hartlepool United before moving to Scotland to join the Terrors in 2007. He signed for Rovers in August after being released by Championship rivals Rangers at the end of last season. Daly, who also played for Republic of Ireland at youth level, has made 11 appearances, nine of them starts, and scored once, for the Kirkcaldy outfit, who lie fourth in the table.